UC faculty in the Academic Senate carry out shared-governance responsibilities established by The Regents. The Senate is empowered by UC's governing body, the Board of Regents, to exercise direct control over academic matters of central importance to the University – to determine academic policy, set conditions for admission and the granting of degrees, authorize and supervise courses and curricula; and to advise the administration on faculty appointments, promotions and budgets. Watch the video as Chair May describes the Academic Senate's support for UC's negotiating position with Elsevier and invites the Board of Regents to join in. View the Academic Senate Chair's remarks from the latest Board of Regents meeting. Photo shows Board of Regents Chair George Kieffer with Academic Council Chair Robert May and Vice Chair Kum-Kum Bhavnani. 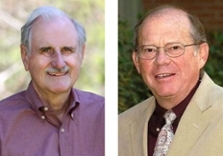 Professors Duncan Mellichamp (UCSB) and Daniel Simmons (UCD) are the recipients of the 2018 Oliver Johnson Award for distinguished service to the Academic Senate.